So the Vehicle Inspectorate Department (VID) said they will be starting to administer the provisional driving test using computers on the first of December this year. The initial roll out will be happening in Harare but they hope to eventually spread this to all centres across the country. As with most things life, this move is both good and bad. The obvious good and probably the chief reason why this move is being undertaken is to curb corruption. It is a public secret that there is rampant corruption when it comes to the licensing of drivers in Zimbabwe. Well, there is rampant corruption in Zimbabwe period. What I didn’t know though is that corruption is not limited to when a learner driver goes for their basic driving competencies test to get the license itself. Oh, no! Corruption is equally bad at the learner driver’s license stage itself. Just to give you context: in Zimbabwe an aspiring driver has to first write an 8 minute exam on the basic rules of the road and some basic stuff around driving and safety on the roads. This test has to be passed by at least 88% for one to be given a Learner’s License. 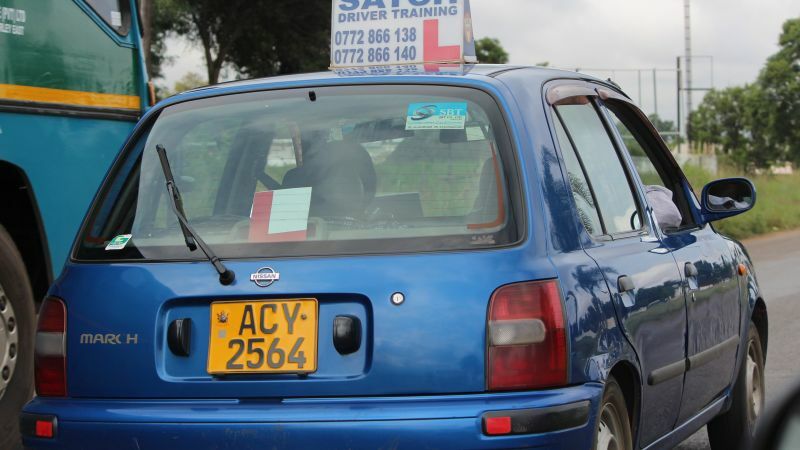 After getting the learner’s license one can start learning how to drive and they are allowed on the roads as long as they are accompanied by an instructor in a vehicle marked ‘L’ for learner. The test to get the learner’s license is quite simple- there aren’t that many road rules are they? However statistics out there claim as much as 60% of people who take the test fail it the first time. The statistics show the test ain’t that simple. Such a state of affairs leads to opportunity for dishonourable people to make money and they are. I was so disappointed to witness money changing hands to facilitate automatic ‘passes.’ It’s a whole industry and it involves a lot of players. You will have a hard time witnessing a VID official getting money from an aspiring driver- no they are not that stupid. This happens through instructors at driving schools (and possibly other people). In a few hours with driving school instructors, I saw 8 people giving these folks $150 (in bond notes cash) each so they would get a free pass. And no, the fee is not negotiable. The paying people would then get very specific instructions: they should go in and write the exam and they should make sure they answer every question although it doesn’t matter where they place their X’s on the multiple choice questions. They are not supposed to speed through this ‘chore,’ pretenses are important. Administering the exam through computers could help curb this rot. Of course this will depend on how exactly computers are being used. The only way this would work is if the exam is composed of randomised questions which are not necessarily the same for any two individuals even when taking the exam at the same time. Already this sounds to me like it’s more complex than has been thought through so I have serious doubts that the computer administered tests are going to change anything. When I went to the VID and I was talking to folks who were about to write the provisional learner’s license test, the subject of the impending computerisation of the test kept coming up. This development was dreaded by virtually all the people I met. This got me thinking: the reason this test is failed like crazy in the first place is not so much that it is a difficult test but because it is a test! A lot of people are just not good at classroom style examinations, they just get nervous and tremble their way to failure. What more, this test is administered in English! The language is intimidating even to the English, what more just a random person who last used the language when they were in school and even struggled with it then. The test is thus testing more than an understanding of the road rules, it’s testing English comprehension, exam skills and solidity of nerves as well. This doesn’t sound fair. What does English comprehension have to do with understanding driving rules and safety? Besides the barrier of English as the testing language and the language used in the exam room, computers will spook a lot of takers of this exam. I could hear that fear on my visit to the VID. To a great number of people, computers are this complex thing that is hard. I remember when I was in university, there was this basic computing course that I took. There were guys (and gals) that were too nervous to even turn the damn thing on. Maybe things have improved? Of course things have improved because a lot of people have little computers in their pockets that is when they are not holding them, tapping away on WhatsApp. However, the number of people you see walking up to guys screaming kuti vanoisa WhatsApp pama phone (they install WhatsApp on phones) tells me computers are complicated and hard things for a lot of people still. Consider that we are talking about privileged city folks who own a smartphone. Imagine someone who is not as privileged- will computerised learner drivers’ tests be truly inclusive? Exclusive administration of the test using computers will make the test inaccessible to a large number of people (more than it is right now). Those who want to get the driver’s license hard enough but do not feel confident about their English or exam skills let alone their computer skills will keep demanding for an alternative. Unfortunately that alternative will be corruption. I was pained to hear some of the people I saw paying their way to a learner’s license saying they seek class one licenses (these are for driving public transportation). They couldn’t see how problematic that was. The bigger problem is that if someone is going to pay to pass the test anyway, they are sure as hell not gonna bother to attempt learning the rules of the road. The instructions remember are that they should just answer all questions anyhow, they don’t need to even read the questions. Mozambique has been using the same system for years,I personally passed through the same test.It is advanced and very clever than you would imagine.It is biometric in nature and only unlocks the exam by matching your finger print to the finger print scanning device on the day of the exam.In fact a lot of things in Mozambique utilise the biometric technology.A criminal record search is computerised and takes only 30.An ID and Passport are all biometrically coded. On the exam day several candidates sit in but the computer generates different tests for all of the candidates in the room. when you pass an exam, the provisonal learner’s licence prints automatically at the reception and the results display at an electronic billboard outside for everyone to see.. The system only allows you to register for a road test after six weeks from the date of issuance of the learner’s licence.This is designed to make it impossible to cut corners in driver training,You know some people in zim write a provisional test on Monday ,pass it and by friday they are going through a road test.The Mozambican system refuses to register one for a road test if 6 weeks hasnt passed yet.This is to ensure that one goes for a proper 6 weeks training during the window period. After passing a road test, the system prints a biometric driver’s licence.It looks and behaves exactly like an ATM card.All your fines are credited to your licence and it when you pay them off they are debited off.This is possible because the traffic police in Moz use a hand held card reader in which your licence is swiped and all the fines history is read out. Even if you forget your licence at home , the police card reader scans fingerprints too and will automatically match you to your licence number (if you really have one).It will also determine if your licence is fake or genuine.It also reads if you an imposed restrictions , eg glasses when driving. Oh wow, Mozambique sounds like it has a very good system there. The equipment I saw at VID did not have any biometric sensors. Zimbabwe doesn’t have a biometric database yet except for the voters’ roll. Unfortunately that means the Mozambique setup is not coming to Zimbabwe soon. Thank you Leonardo for breaking the myth that Zim is way ahead in SADC (in some cases). Our tendency in Ziim to do everything from first principles has, in my view, resulted in us lagging behind as we grapple with stuff others have been using for years. Some things are easily adopted and implemented instead of as the cliche says….’re-inventing the wheel”!! Understanding why the rules of the road exist can help those struggling with the Provisional tests…..rather than “cramming”. Cramming has been instilled in so many of us. I think that’s why failure rates are so high and then corruption follows that ‘high.’ besides some of the factors I shared above. Corruption also thrives when people see it happen, but don’t report it, even anonymously. Most people only try to complain once they have been flunked, then it looks like a case of sour grapes. Anyway, the author has failed to identify some of the benefits that come with computerisation, such as allowing testing in multiple languages. The questions and answers need only be translated once, and they’ll be available everywhere in Zimbabwe. You can also perform analytics to understand which concepts are hard for learners to grasp. The issue of technological phobias is irrelevant. Progress cannot be inhibited by individual fears, which can be overcome without major effort. People are afraid of many things, some people are even afraid of getting in cars, doesn’t mean they should be avoided. The lack of tech savvy in Zimbabwe is based on laziness to a degree. We have a delegative mentality, it’s not even just about phones. Most of us would rather pay their “guy” to do something for them, that they could have done themselves. That’s why you’ll find most people don’t even change their own punctured tyre. They’ll call road angels, if they can afford it, or are a member. Even if you give people clear instructions on how to install an app, or even a link directly to the playstore, a person will still ask you to do it for them. That’s laziness. I doubt though that one can survive as a driver without comprehending English. Most of our road signs are in English, even the admission of guilt form is in English. I’m yet to meet someone with nil comprehension of English. Not that we shouldn’t allow testing in other languages. Hey you raise very good points. Yes computerisation may get us much quicker to vernacular translations. Analytics too! Very good points!! Most road signs are pictographic so I don’t think there will be much struggle for some who is not comfortable with English. Where are we with computerized provisional test. My child was tested using the usual pen & paper on Friday 7 December 2018.